Opposition Leader Bharrat Jagdeo this afternoon rejected a plan by President David Granger to name a date for general elections using the GECOM benchmark of November and he warned again that as of midnight tonight the government would be considered illegal. Jagdeo’s letter dated today was in response to one to him yesterday from Minister of State Joseph Harmon on behalf of President Granger. (See story below). In his reply to the letter, Jagdeo said “In the public domain, I have already expressed my views on the framework" provided by the Chairman of the Guyana Elections Commission' - one that includes national House-to-House Registration and General and Regional Elections in `late’ November 2019. I reiterate that the timeline outlined by the Chairman of the Guyana Elections Commission, in his March 19, 2019 letter, is totally unacceptable. 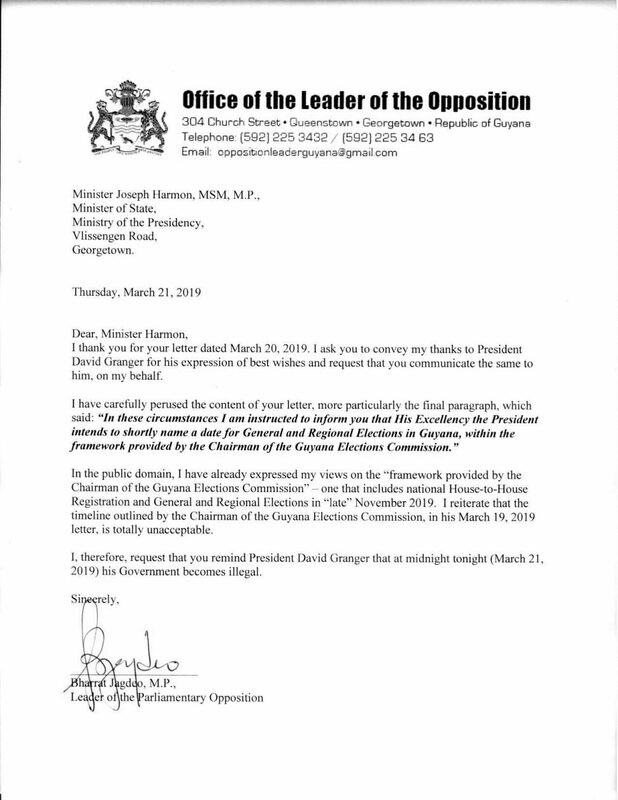 “I, therefore, request that you remind President David Granger that at midnight tonight (March 21, 2019) his Government becomes illegal”.